"The concept of punishment is intuitive, logical, proactive, and, on the surface, seemingly hard to debate. Unfortunately, the premise that we can punish our way out of crime is fundamentally flawed." So say the authors of From Retribution to Public Safety: Disruptive Innovation of American Criminal Justice, Dr. William Streusand, a board certified psychiatrist, Professor William R. Kelley, the director of the Center for Criminology and Criminal Justice Research at the University of Texas, Austin, and the Honorable Robert Pitman, federal district court judge for the Western District of Texas. Punishment, the distinguished scholars argue, is not an effective solution to the problem of crime; in fact, the bloodthirsty desire for punishment in America is what has led to the development of a massive, and massively incompetent, criminal justice system and carceral complex. The problem with criminal punishment is that it does not change behavior, and it does not reduce recidivism. The literature supports this proposition, but one need look no further than the American criminal justice system to understand that punishment does not work. We are the most punitive nation on earth, with an incarceration rate that rivals that of Joseph Stalin's, in the early 1950s. Despite that staggering fact, recidivism rates in this country hover around 65 percent. If the object of the criminal justice system is to control crime, the American system is an abject failure. Punishment is an easy political sell, though, regardless of its efficacy. "Tough on crime" wins elections, and regardless of what actually works to lower crime, drives criminal justice policy. The criminal justice system gives an economically unsustainable return on investment, yet continues to grow. This exposes a serious flaw in the American system of justice. According to the authors, a punishment-above-all system fails to take into account four significant threats to recidivism reduction. Intellectual deficiency, which is overrepresented in the criminal justice system, increases the likelihood of recidivism, and also reduces the moral culpability of the defendant. Yet the criminal justice system fails to properly consider or deal with this very real issue. The system also fails to properly address substance abuse disorders. The United States is exceptional when it comes to punishing addicts while simultaneously failing to address the addiction itself. The authors note that nothing about punishment changes the physiological and neurological realities of addiction. Why do we punish addicts when it clearly does nothing to address the underlying problem? Because of an erroneous understanding of addiction. The idea that using drugs is a moral failing has contributed heavily to American criminal justice policy, and has led to the incarceration of many individuals who are simply addicts. Neurobiological disorders are also abnormally overrepresented in the criminal population. Scientific advances have revealed the importance of a properly functioning prefrontal cortex to everyday, law-abiding existence. Damage to this area of the brain impacts moral reasoning, impulse control, and behavior regulation. Yet the criminal justice system does little to consider the culpability of criminal offenders who suffer from such impairments. Perhaps the largest threat to recidivism, and the largest failure of the criminal justice system, is mental illness. Prisons and jails have replaced psychiatric facilities as the repository of the mentally ill. Unfortunately, both the criminal justice system and the carceral complex are incapable of properly dealing with the mentally ill. As such, the mentally ill are punished when they should not be, and do not receive needed treatment while improperly incarcerated. This double whammy virtually guarantees higher recidivism rates. The failings of the criminal justice system and the threats to reducing recidivism are monumental problems. They will not be successfully addressed in a simple manner. The authors acknowledge this, and what they propose as a "path forward" would indeed be a sea change to the American criminal justice system. What is needed, they argue, is a massive dose of disruptive innovation. The authors propose the development of a widespread criminal justice diversion system. A panel of community based professionals would, in conjunction with prosecutors, sort criminal defendants into one of two baskets: the diversion basket and the incarceration basket. Using their expertise, these professionals would assess the risk presented by the offender and balance that with the offender's culpability and amenability to treatment. If diversion is recommended, the professionals would then monitor compliance with community based programming and continually manage risk. Those deemed unworthy of diversion would be referred for prosecution and incarceration. Prosecutors would retain full authority over every case in this model. They would be permitted to deem a case improper for a panel's consideration, and would have full veto power over any diversion decision. According to the authors, prosecutors must retain full prosecutorial discretion in order for the system to function properly. Determining who the candidates for diversion should be is an important and difficult piece of analysis. The authors suggest several "spheres of psychological dysfunction" that should be considered, including severe emotional dysregulation, failure of empathy, failure of impulse control, intellectual impairments that impact judgment, executive dysfunction, distorted reality, distorted self, reactions to trauma and abuse, and addiction behaviors. A diversion program such as that proposed would be a massive change to the criminal justice system. It would also be expensive—in most instances, the proposed community based treatment programs would need to be built from the ground up. But our current system doesn't work, and costs up to $1 trillion annually. From a cost/benefit perspective, a diversion program that is outcome-focused and properly run will save money. Politics and prosecutors are significant barriers to what the authors propose. Upfront costs would be hefty, and the idea of treating criminals instead of punishing them is not an easy sell. But the authors argue that prosecutors and politicians should ultimately get on board with the proposal because "it will reduce recidivism . . . slow the revolving door . . . promote public safety . . . [and] reduce victimization and cost." Unfortunately, in their desire to ensure that prosecutors will get along with this proposal, the authors have missed a golden opportunity to address a significant problem in the criminal justice system: the unchecked and God-like authority of the prosecutor. The proposal places an already too powerful prosecutor at the gateway of what cases can be even considered for diversion. It also gives the prosecutor full veto power over diversion decisions. These accommodations to prosecutors could quite possibly swallow the entire diversion concept. Subject to the vagaries of political winds and the corrupting influence of ultimate power, prosecutors are in need of a check. The panel of community based professionals in the authors' model would fit that bill. But the situation in the criminal justice system is dire. It doesn't reduce crime and costs an absurd amount of money. The criminal justice system is in need of a seismic shift, and Kelley, Pitman, and Streusands' proposal is exactly the kind of major change needed. 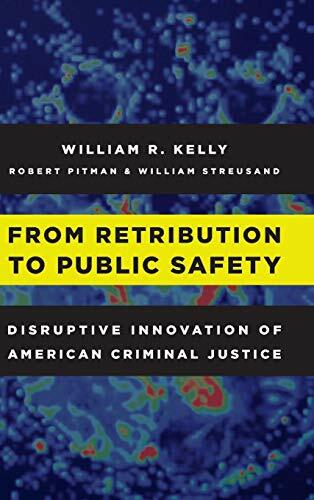 From Retribution to Public Safety is a refreshing and important contribution to the criminal justice reform discourse.